September 2014, I had a Lumbar spine (low back) disc degrade to a severe level and put me in constant excruciating pain that was unrelenting and made basic and essential ADL's (activities of daily living) such as bending over to brush my teeth, getting on and off the toilet and trying to sleep, a constant painful nightmare. Prior? Sitting has always been my most painful position due to spinal compression, but standing and lying down were manageable. Not after this disc went. I couldn't find relief no matter what so I got an MRI in October. Sciatica down my right leg. Right foot tingling, numbness and a constant "hot foot" sensation. If unfamiliar with this, my foot felt uncomfortably hotter than the rest of my body. Widespread pain across entire lumbar region that made any position painful and sitting and bending over, impossible. In November, I saw my neurosurgeon, the fantastic Dr. Kris Webb of NeuroTexas to whom I will always be eternally grateful for a very well done Anterior Cervical Discectomy Fusion (ACDF) on C5-C7. Dr. Webb reviewed my newest spinal MRI's and explained that since my L1/L2 disc had degraded to a severe level, I was feeling the "bone on bone pain of the vertebra because the disc is no longer able to do its job as a cushion". I asked him "Can you insert a balloon or something around the disc to pad it, like they do in the heart?" He smiled and nodded and said that something along those lines was being studied but it wasn't ready for use yet. I asked if anything non-invasive (no cutting) could be done to save it? Dr. Webb replied "The problem is that there is very little blood flow to the discs and since blood is a source of nutrition, this means that once they begin to degrade as in the case of DDD (degenerative disc disease) there's really nothing that we can do to stop the process, so no, I'm afraid that your disc can't be saved." Having gone herbal so successfully I asked him if he had any non-surgical remedies to help reduce this hideous pain? #2 Weight - Obviously, the more obese a person is, the more stress there is on the joints which are very important to the strength of all the structures that they support in the spine and elsewhere, such as the knees. Thus losing weight if obese is vital. Once again, I'd had it with pain ruling my life. I set up an appointment with my pain management surgeon to get scheduled for an out-pt pain procedure and began thinking about my visit with Dr. Webb and how he said that the issue with the discs not being able to be saved is due to the lack of blood flow. I started thinking "Okay, if I can't save the disc because of that, at the very least, can I SLOW the progression of my DDD and if so, how would I do that?" either a nutritional (diet) aspect or via supplements. a pro-structural protein and ﻿in virtually everything! Hair, skin, nails, joints, BONES AND DISCS. BINGO! I then started researching collagen supplements because I know me and as a picky eater, I am simply not going to eat all of the things that offer it. I ordered them in December 2014 but due to being slated for a pain management procedure in early January 2015, I did not start on them because I didn't want there to be any uncertainty about if any improvement was coming from the procedure or from the supplement. Please see below for more on this Key Point. Due to the minimal pain relief I ended up having two more pain procedures. 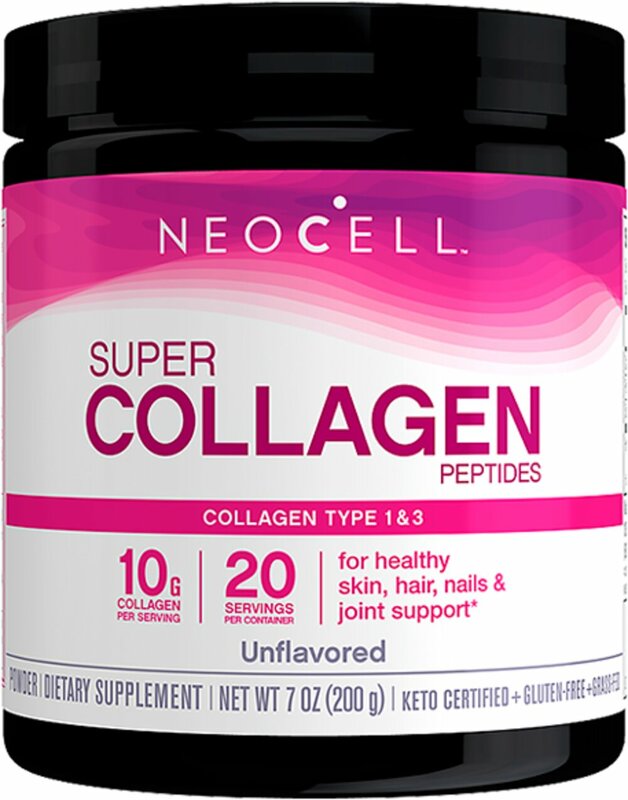 Because I didn't want to start my collagen supplement before I gave my pain procedures a fair and full chance to do the most for me that they were going to, (if they were going to help, there is no guarantee they will), I asked my pain doc, "What is the longest it takes for a pain procedure to produce the results if it is going to work?" I had 2 different pain management procedures in January and a third in early February. They definitely provided relief on some levels but it wasn't enough, nor long lasting. Thus, one week after my third procedure, I began taking the aforementioned collagen supplement QID (4 times a day) hoping that it was the much needed panacea for pain. As I said above, I'm no expert on collagen and my research was minimal and done while in great pain and on pain pills, both of which cause severe attention span and memory issues. Thus, when within the first two weeks I noticed my skin was even smoother than usual, I was very pleasantly surprised! Ditto when I also realized it was contributing to a reduction of thinning hair and hair loss! I'm sure these common benefits were listed in the links I researched but my only focus was what they could do for my DDD pain because when you are in screaming pain, you could care less about anything but relief. Being "greedy" for additional pain relief, I eventually did more reading and began learning about Liquid Hyaluronic Acid and L-Proline* and how these supplements work synergistically with collagen! I never did return to the same level of pain or comfort in my L-Spine that I had prior to September 2014 but given the extensive and numerous areas of both damage and spinal disease processes I have (see my home page for the list) I believe I do much better than many with my same diagnoses and pain challenges who take numerous mood and mind altering Rx's that strip a person of their best quality of life every bit as much as severe chronic pain does. And it's all thanks to God and these supplements. and this can cause you pain at some point in the future. I had no idea it was from a porcine source. something that goes against your beliefs. For financial reasons, I had to cut back from taking these items daily to 4 days a week; I figured 4 days a week would be a good maintenance dosing and it has still been beneficial. If you are financially challenged, please know that taking beneficial herbs and supplements like this or even every other day once you get it in your system, is better than nothing. If you have to cut something else out of your budget like Netflix or other things that do not contribute to your health and wellness in order to afford things that do, do so. I am happy to say that I have maintained this routine since and though I did have to have one more pain management procedure in November 2015, that one was for my neck and shoulder nerve pain and numbness; and though this procedure did not entirely eliminate the pain issues, it was far more successful than my L-Spine ones. Thus, I can't help but consider that could be (IS!) most likely due to being on the collagen for 9 months, liquid hyaluronic acid for 8 months and L-Proline for 3 months. For the record, after the porcine based types I and III collagen supplement I tried initially, I then tried a chicken cartilage based one and to say that it didn't agree with me is an understatement, which really surprised me. But you can't win them all and given how immeasurably successful I have been with managing numerous conditions naturally as the rule, I'm sharing this fact to let you know that not every supplement works the same or even well, for every person. Thus, always use common sense, do your research, ask the right people as many questions as it takes for you to get a handle on things and then, most importantly, LISTEN TO YOUR BODY! It knows what it likes and what it doesn't. It will react to things it doesn't. I do not understand them fully and found that having made the effort to ask them did not really do anything helpful for me except to find out that the first one I took (bottle pictured below) was made from a porcine source. What form of hydrolysis is used? so that it doesn't stick to the glass as much. 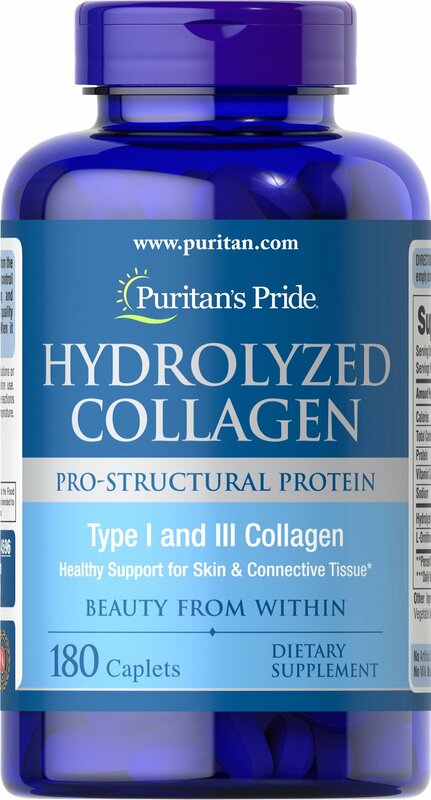 The only downsides are that it costs a lot more than Puritan's Pride Hydrolyzed Collagen of types I and III and since it only comes in a 7oz jar I have to stay on top of ordering it frequently whereas thanks to Puritan's Pride AWESOME buy 1 get 2 free deals, I not only get far better pricing but I don't need to order near as much. The good news is that Puritan's Pride sells both! So, try both and form your own opinion about which is best for you! Although I am faithful to very specific brands for every herb, vitamin and supplement that I take, some of what I take is sold by each of the online companies that I patronize. Thus, when I need to buy Super Cell Collagen Powder, Source Naturals L-Proline and NOW brand Liquid Hyaluroni Acid, I buy them from whichever company has the best deal and/or coupon offer going at the time that I order. These links are for the companies I use and my referral link is in each one's review. for them so that we both may enjoy referral rewards! This is one to remember when trying to figure out what works best for your body. NEVER implement two new efforts within the same 2-4 week period unless they are known to work synergistically; otherwise, if you have a reaction you will blame both when only one may be the culprit and conversely, if you enjoy success, you won't know which may be the only one providing it. Making prudent health choices is as much about common sense as it is learning about your options from those who know of what they speak. This is a picture of the very first collagen supplement that I took; made by Puritan's Pride. This is the powder collagen﻿ I take currently that you can also buy from Puritan's Pride to enjoy great pricing!